The shimmering salt pans of Makgadikgadi along with the Nxai Pans are believed to be the largest in the world. Most of the time they appear as glaring, white, endless plains. During the rainy season they are one of the most important wetland areas in Botswana - when they transform and come alive into stunning grass-plains. Makgadikgadi Pans is situated directly between Maun and Francistown. When it rain, the pans come to life with water birds and great herds of game. The Makgadikgadi pans are the remains of a once ancient lake and now form part of the route of Southern Africa's largest remaining migration. Travellers can expect something slightly unusual from this part of Botswana. 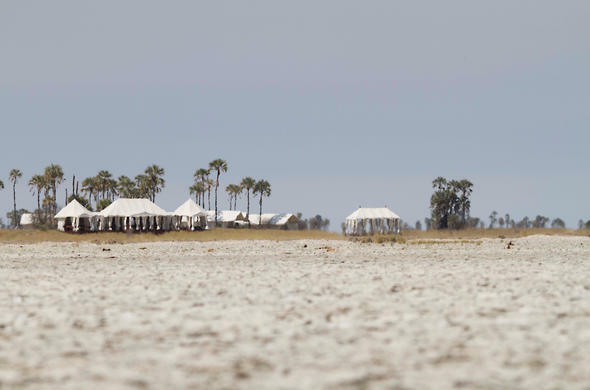 Kubu Island, with its huge baobas, is one of the most mysterious places of the Makgadikgadi Pans. There are two permanent tented lodging options available to you - Jacks Camp and San Camp. Both featured on this page. Both dry season and wet season visits to the Makgadikgadi Pans are recommended in order to witness the dramatic appearance of the pans at their driest, when they appear hauntingly beautiful in their desolation. And to experience the wet season when the pans fill with water and attract a myriad of flamingos, pelicans, ducks and geese together with large herds of zebra wildebeest and game. A good suggestion is to link a few days in Makgadikgadi with a similar period of time in Nxai Pan. That will give visitors a distinctly different experience. 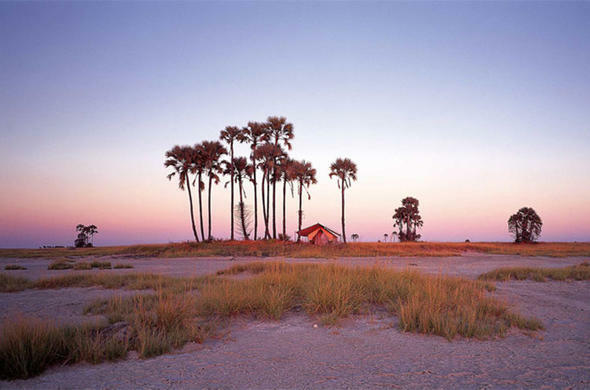 In 1970 the Makgadikgadi Pans National Park was declared a game reserve. However, in December 1992 it was enlarged and declared a national park. Today it comprises 4 900 square kilometers. The ancient lake Makgadikgadi once submerged the whole park. The Boteti River forms the western boundary of the Makgadikgadi Pans National Park, which is filled with natural wonders like the Baobab. It is the largest tree in Africa and is approximately 5300 years old. A crack in the tree was used as the first mailbox in this part of Africa. Explorers such as Livingstone and Courtney Selous used to leave letters for one another while travelling through this part of Africa. The plains of the Makgadikgadi Pans National Park teem with wildlife. During the dry season Wildebeest and Zebra can be observed on their thousands. Predators include Lion, Cheetah and Hyena. Antelope are the most common type of wildlife in this area, and from November to May they can be spotted as they come together to the sparkling water. Game viewing is at its best in this area during the wet season and a bird watchers paradise. Experience the view of large herds of antelope converging on the great lakes to drink and play. The large flocks of migrant flamingoes is definitely a sight not to be missed. Experienced Bushmen trackers will take you on guided walks to historical sites and you will learn about the connection between their ancient culture and the natural environment. 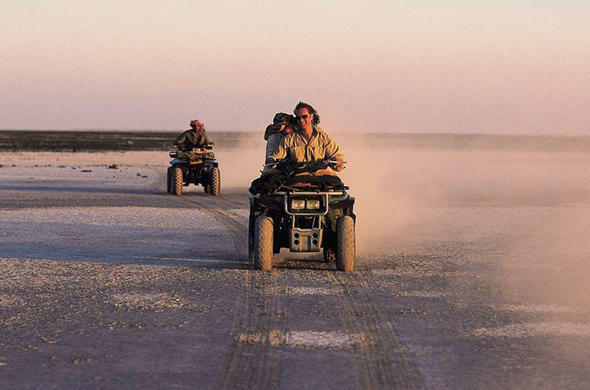 Venture into the more remote sites in the impenetrable Makgadikgadi salt pans on 4WD bikes to explore this interesting piece of land. The Boteti River is very wide, at over 300 metres from bank to bank; this is surprising because now the Boteti is dry and only in times of exceptional flood flows to its delta in the Makgadikgadi saltpans. General belief has it that the Boteti was previously the main source for the Greater Lake Makgadikgadi. Estimated figures show that the super lake covered 60 000 to 80 000 square kilometres! The highest level reached was 945 metres above sea level 50 000 years ago! The Zambezi, Cuando and Okavango Rivers flowed through the Okavango Delta into an area incorporating the Okavango Delta, Savute Marsh, Chobe National Park, Lake Ngami, Orapa, Nxai Pan National Park, Makgadikgadi pans and Nata, a vast area under water, and now a desert! The demise of the super lake was likely caused by tectonic activity, tilting of the continent. Rising waters found a new exit to the sea along the Zambezi over the Victoria Falls and through Mozambique to the Indian Ocean. The Bakalanga tribe originated from Matabeleland where they fled the Ndebele wars, most arrived later in the 1930s and 1970s. The Bakalanga, cattle owners, didn't get on with the Bateti who wouldn't give them their own land along the river. Instead, they asked them to plough the lands in exchange for small plots along the river. The insufficient land utilised by the Bakalanga forced them to buy grain from the Bateti, paid for with cattle. The Bateti consequently built up sizable herds of their own. In 1934 the district commissioner reported that overgrazing along the Boteti was so severe that cattle were being moved, illegally, to Crown lands to the northeast. This had a detrimental effect on fodder for wildlife and forage of wild edible plants by some of the communities. While at Mokokong, the Bakurutshe tribe split owing to a dispute over chieftainship. Lesele, the tribal leader, was not the senior member of their royal line and had to reluctantly secede to his half brother, Moatshe, after a period of time. Shortly afterwards, the two brothers quarrelled. Moatshe had sent out a hunting expedition under Lesele. A Rhinoceros was killed. According to custom, it should have been offered as tribute to the chief before being skinned. But Lesele, wishing to provoke a dispute that would enable him to recover the chieftainship, deliberately skinned the animal before reporting its death. The quarrel that he anticipated duly followed. In the resulting conflict Moatshe was defeated. He and his people then fled to the Boteti River, where they have been ever since, and Lesele once more became chief of those who remained behind. Under Moatshe, the Bakhurutshe kept many sheep and goats and occupied land given by the Bateti; they intermarried and maintained good relations. Bananjwa tribe ...also originated from Zimbabwe first settling in the Gweta area north east of the Boteti. Bayei tribe...travelled from Zambia through the Okavango Delta to settle along the Boteti. Bayei are fishermen and agriculturalists, less involved in pastoralism. They introduced many of the river activities to the Okavango and Boteti. Baherero tribe ...are pastoralists from Namibia escaping the German/Herero wars at the beginning of the 1900s. Their women brought the traditional dress of long bulky dresses and elaborate headdress, originally worn by the German settlers, to Botswana. Bakoba, Basobea, Batawana, Bangwato, Bakgalakgadi tribes integrated into the multiple ethnicity of the Boteti region, as immigrants and refugees.